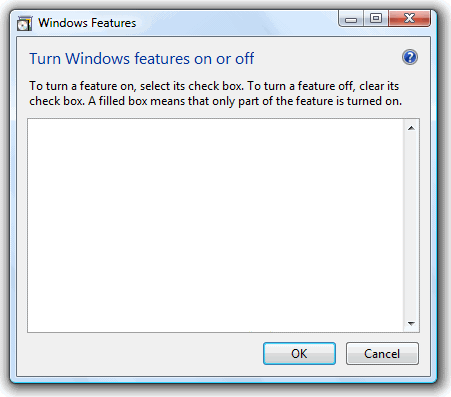 The following is a three day saga of empty 'Turn Windows Features on or off' dialog. This dialog, as unimportant as it may seem, is the only orifice into Windows subsystem installations without having to cramp up command line msiexec.exe wizardry on obscure system installation folders that nobody wants to understand. If you still can't control your MSMQ or IIS installation, then you need to find out which of the servicing packages got corrupted somehow. Servicing packages are Windows Update MSIs, located in hell under HKLM/Software/Microsoft/Windows/CurrentVersion/Component Based Servicing/Packages. I've got a couple thousand under there, so the only question is how to get to rough one out of there. Then find the package in registry, take ownership of the node, set permissions so you can delete and delete it. Your OptionalFeatures.exe work again and it took only 10 minutes. Interoperability day is focused on, well, interoperability. Especially between major vendors in government space. .. and the lack of support from legislature covering long term electronic document formats and their use. I'm sorry it took a week, but here we go. This is my exit content from Bleeding Edge 2008. I'm also posting complete conference contents, just in case. Thanks go out to Dušan, Dejan, Miha, Miha and Miha. Remark: PPT in Slovene only. Code international. Thank you for attending. Hope to see you next year! I'm happy to announce our organization work is coming to fruition. Bleeding Edge 2008 is taking the stage for the autumn season. Go for the early bird registration (till September 12th). The time is now. Potential sponsor? Here's the offering. One of our core products, Gama System eArchive was accredited last week. This is the first accreditation of a domestic product and the first one covering long term electronic document storage in a SOA based system. Every document stored inside the Gama System eArchive product is now legally legal. No questions asked. Accreditation is done by a national body and represents the last step in a formal acknowledgement to holiness. That means a lot to me, even more to our company. We've made a lot of effort to get this thing developed and accredited. The certificate is here. This, this, this, this, this, this, this, this, this and those are direct approvals of our correct decisions. There is some serious pain going on when you need to add a simple custom document property into multiple Word 2007 text areas. Say you have a version property that you would need to update using the document property mechanics. And say you use it in four different locations inside your document. There is no ribbon command for it. There was a menu option in Word 2003 days. There is no simple way of adding to The Ribbon. You have to customize the Quick Access Toolbar and stick with ugly, limited use icons forever or so. 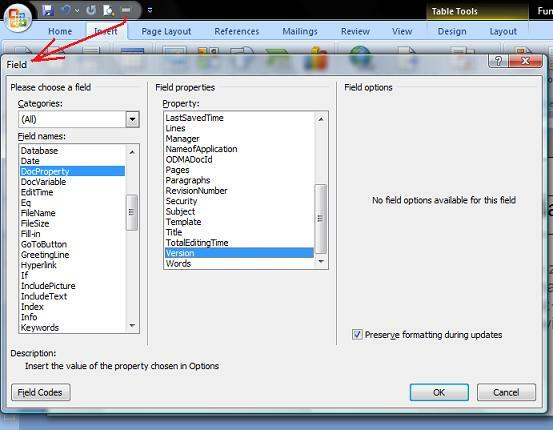 You need to choose All commands in Customize Quick Access Toolbar to find Insert Field option. This is not the only limiting option for a power user. The number of simplifications for the casual user is equal to the number of limitations for the power user. And yes, I know, casual users win the number battle. Please, give me an option to get my menus and keyboard shortcuts back. I noticed an awkwardness on my IIS6 server installation today. All my sites were running with a US locale, thus invalidating the currency/date time/decimal calculations by an order of magnitude. 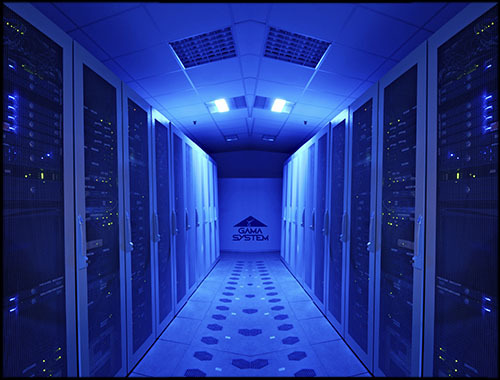 The problem was that the server was installed using the default settings, and also applied those to the Network Service account under which most of my sites work. You should have your locale set. Change the only occurrence of "IsSecureProperty = True" to "IsSecureProperty = False". Save. You should have both passwords now. This comes handy when you need to fine tune the settings of both built-in accounts. If you need a distraction free writing environment, grab a copy of Dark Room. I found it after a few years of using WriteRoom, the original, on a Mac. I write most of my draft documents in it. Then I move them to Word and apply formatting. I write all blog entries - exclusively in Dark Room - every post. It does what every text editor should be doing first. It makes you concentrate on the subject. And, best of all - it's small footprint, single .exe app. Xcopy it to your path. Bam. I just finished presenting my talk on the October 2006 Slovenian MSDN event. WCF service using wsDualHttpBinding for duplex session communication scenario. WCF service hosts a workflow which computes stock tax based on the current (complex) Slovenian legislation. WF workflow named ComputeTaxWorkflow. Workflow calls out to our public ASP .NET WebServices: StockQuotes and ExchangeRates. Check it out. It's free. We had a nice discussion throughout the day today, together with around 50 attendees. It's hard to even cover feature changes of .NET 3.0 in a day, but we managed to cover the important things of WCF and WF, spending a complete day inside the Visual Studio. And the link to the Tom Archer's compatibility matrix for the .NET Framework 3.0 downloads. This has bothered me for two weeks. There was no way to install .NET Fx 1.1 on a Vista 5456 box. After the permission fix, Framework 1.1 and SP1 for 1.1 install flawlessly. This happens after hibernation is attempted. The error is: "Insufficient system resources exist to complete the API." The solution is Q909095. There is a hotfix available, but you have to call Microsoft PSS to get it download the patch. It includes a new OS kernel which works flawlessly on my ThinkPad T60p with 2GB. Today, Google released Google Web Toolkit, which is an alternative to Microsoft's Atlas. Indeed, Hell is freezing over. Industry at large is competing for every piece of programming world. The idea of having ability to influence programmers into using your platform has become eligible for every vendor. There is a special case of positive addiction present in the development world. I call it tool addiction, because it's actually not bound to a specific framework and/or platform version. No one wants to use notepad.exe during development of a serious solution, right? We do need that Intellisense after all. Although it's just a bunch of programmatic schema definitions, one gets addicted to it. Platform vendors know this. This is the main reason tools are becoming free. The addiction flu is spreading out of the platform world, into the tool space, and as it seems to specific framework space. Anyone who is offering anything for free has a background plan. They are not that stupid. Vendors know that once you get hooked it's not easy to be abstinent. This has to be one of the best written analogies between current framework use cases ever. We indeed are in a state of using ANYTHING that can make our developer lives easier, no matter what the consequences are. An often times, consequences manifest themselves in increased costs, time-to-ship prolongation, complexity and speed. Go read it. It's worth way more than the time spent. My current occupation leads me to spend as much time as possible in WinFX. WinFX should stand for Windows Framework Extensions. What a Windows Framework is, I don't know. I know what .NET Framework is, but that's another drop in the ocean. Having said that, there seems to be inconsistency between what is, will be or was inside WinFX (or WinFX Runtime Components, if you wish). WinFX mysteriously dropped WinFS and inherited something called Workflow - Windows Workflow Services (now called Windows Workflow Foundation). At first, Windows Workflow Foundation was acronymed WWF, which makes sense - you've got WPF (Windows Presentation Foundation - Avalon), WCF (Windows Communication Foundation - Indigo) and WWF (Windows Workflow Foundation - WWF). It is now 2006 and WWF is acronymed WF (just Windows Workflow) and it is still a part of WinFX. WinFS is still gone (scheduled to be released after Vista ships). What worries me the most is that the current plan precludes that this technologies won't make it into the Vista ship vehicle. They just won't be deployed with the OS. If you make all the fuss around it, invest major tolars in education budget you still won't be sure that the client supports it. Windows Installer 3.1 is a wonderful thing, but nonetheless, if anyone can deploy groundbreaking technology in no time it's Microsoft. Sure, there are 'small footprint security implications' guidelines driving Vista, but no one is saying this beast should be deployed in active state. Make it available and make it passive. Support it via Windows Update if showstoppers arise. There is no need to be scared of another IIS 4 story. There are mechanisms for deploying technology and not using it by default. Please, do not make WinFX fade. For now, I can't see any major differences in programming model of January <> December WinFX CTP. WinFX January 2006 CTP just went live. With it, a Go-Live licence is available for WCF and WF. Sign and deploy. Update: They managed to screw up the download links again. Beware: If you're downloading complete installs (and not the setup manager) use the lower links for x86 and x64 images (there are two on the get the beta page). You can also check the file version. The correct WinFX RTC version for January 2006 CTP is 3.0.50727.154 (file size 44.488 KB [x86] and 84.464 KB [x64]). December CTP was 3.0.50727.151 and file sizes were a couple KB lower. If you happen to be in the 64-bit world (read running a 64-bit OS on the x64 box, not IA64), there are two options on how your managed code runs. The high order bit here is the flag under which the image was compiled. Since you cannot compile for 64-bit architecture in .NET Framework 1.0/1.1, and 2.0 is your only choice, let's focus on Visual Studio 2005/.NET Framework 2.0 features. If you look under the hood on a x64 box, you will find that VS 2005 installer will drop TWO frameworks on your machine. The 32-bit framework will install in c:\windows\microsoft.net\framework directory, the 64-bit framework will install in c:\windows\microsoft.net\framework64 directory. If you installed .NET Framework SDK, you will get two SDKs too. One will be in c:\program files\microsoft.net\sdk\v2.0 64bit (64-bit), the other in c:\program files (x86)\microsoft visual studio 8\sdk\v2.0 (32-bit, installed in VS 2005 base directory). What happens at load time is the CLR runtime host decides on which CLR it needs to load based on the CLR metadata flags. Normally, if you do not change the defaults in VS 2005, your assemblies will be compiled using the 'anycpu' (also known as MSIL flag) which will allow the runtime to host the managed app in a 64-bit process on a x64 box and in a 32-bit process on a x86 box. You can, however, control and override this default behaviour even after your code has been compiled. There's a handy tool called corflags.exe present in the SDK that allows you to force 'anycpu' compiled code to use 32-bit process in 64-bit world. More on that in another blog entry. My old laptop died on me this past weekend. Even though it wasn't much of a machine lately, it was dependable to the very last moment, when it decided to stop working completely. Dell Inspiron, RIP. It's a 64-bit machine, based on AMD Turion 64 processor. It looks splendid, although I have to admit that if it would be possible, I would remove the Ferrari logo during my meetings - even though I am a Ferrari F1 fan. I'm running Windows Vista December CTP x64 edition, including VS 2005 + .NET Frameword 2.0 x64, WinFX RTC December CTP x64, Windows SDK x64, etc. The article compares Intel Pentium M 760 (Dothan) and AMD Turion 64 ML-37. It's a great article considering the shift to 64-bit is currently underway. If you are planning to install or have already done so, there's an issue with the automated install of December CTP of WinFX RC (Runtime Components). And to make it even more complex, if you happen to install it in Windows Vista December CTP, there is no way to remove it and have a clean machine afterwards. How do you know if this thing screwed you up? You will not be able to install a 1GB pack of Windows SDK (December 2005), which also includes WinFX docs and samples. Another proof are filename timestamps of for example System.ServiceModel.dll and friends, which are 11/18/2005 - equaling to November 2005 CTP dates. Today, when I was driving back home from a client of mine, I managed to squeeze some time off between the necessary phone calls to reason about the state/discrepancies of technology adoption between different businesses. There's an obvious dicrepancy present. There are businesses which challenge technology. There are businesses which know about Vista/Indigo/Avalon/Workflow progress. There are businesses which think they know about Vista/Indigo/Avalon/Workflow progress. And then, there are real businesses. By real I don't mean successful businesses. A business can be successful and not real at the same time. What I mean by real is large, heterogeneous, multi-platform, cross-racial businesses. They just do not care. Adopting a new technology can help you increase business opportunities. It can also slow you down during the learning cycle. If there are too many learning cycles, you can be slow all the time. New technology usally costs money. It costs in terms of licences, training and lost working hours trying to make it work. This is counter productive in terms of fulfilling/achieving business opportunities. The outcome is that real businesses take wise decisions and adopt when the time comes. They do not rush it. That's one of the reasons that makes them successful. This should not be read as if my opinion is to wait till technology matures. There are rare cases that mandate usage of new technology instantly. Available for download for all MSDN subscribers. Currently only Visual Studio 2005 Professional is available. Other SKUs have been pulled, probably because of bandwidth issues. Also available: SQL Server 2005 RTM. Now it's time to wait for the corresponding WinFX SDK to appear. There have been quite a few book requests in the last 14 days, while I was away. If anyone who requested the latest book still didn't receive a copy, please write another email, because it is entirely possible that it got lost somewhere. A bunch of you wrote emails to get my new book. And that's great. Love it. If you missed it, you can do it again. "Why do you distribute it for free?" "I'd love it, by why do you distribute it for free?" "I would buy it, if you are selling it." "I'm gonna make sure I buy it." "I'm gonna make sure we buy it." "I can't believe that you believe in open source." I'm not doing it for the money. I'm doing it to distribute thought, knowledge and/or religion. This book is free, as long you are not making direct profit from it without making me a part of it. You can, though, contribute to local general religion awareness anytime. "I have a problem with chapter X.Y.Z. I can't believe you believe this is the right way to go. In any case, I would chose B over A anytime." "Second paragraph in chapter X is just too general. I can't relate to that." "Having spent the last two months on this technology, this just can't be the best way to go." "There's a specific problem with X in chapter Y if you want to do it in our environment." Over these, I have no control whatsoever. I strongly believe that scenarios are different in everyones lives. I have to stress again that English reading/speaking audience can NOT benefit from it, since it's written in Slovene. Having spent the last two weeks tweaking my diagrams and pictures with a book designer, I learned quite a lot about differences in a design and development environment. To get facts straight, they live in a DPI-based world, which is nasty. And since my designer uses MacOS X platform to do the design stuff, a lot of interesting issues arrised. Again. What I wanted to convey is: The book is finally done. Its physical incarnation should be available to general developer/architect public in a few weeks, but most definitely here. Everyone who managed to send me an email after my previous blog post, will be getting a copy in his/her mailbox today. If you would like a copy (electronic one, that is), drop me an email using this link. 5.1 KAKO UPORABLJATI .NET ENTERPRISE SERVICES? 6.2.1 Kdaj klicati metodo Dispose? If you still don't have my previous book, Arhitektura spletnih storitev - Usmeritve za načrtovanje, you can write to me using this link. Thanks again to all the reviewers and especially to Microsoft gals who had to read this technical, unreadable text during the proof reading process. Thanks to Mateja from Alten, for doing a fantastic design work. Microsoft “Indigo” is now available for general public. If you are an MSDN Subscriber, you can download the bits from here. This week I'm clearing issues and fixing mistakes of my current brain child. It's a book on application architecture. A lot of people seem to think the draft is ready for print, which is actually not the case. By far. I value all opinions and learn a lot from them. Kudos go to all of you, you know who you are. It's supposted to be available by the end of January 2005. Published by Microsoft Slovenia and distributed to all Slovenian architects and lead developers. If somebody would like a copy of final cleartext, please send me an email. And yes, it's NOT written in English. Yesterday we launched a developer oriented user group in Slovenia. The event was held in Microsoft Slovenia conference room (Ljubljana, BTC). We had around 25 attendees, some beer and pizza. As always, everyone is welcome. Will follow up with specific URLs of SLODUG homepage, when it becomes available. Look at the timeout period for you SCTs, issued by the server-side service. If this is all ok, then you're probably in my situation. Check if you enabled web garden support in your IIS's application pool. If so, go back to Performance tab in application pool's properties and enter 1 (one) as a 'Maximum number of worker processes'. Things can get really rough in a state WSE2 is in if you create a web garden and use WS-SecureConversation at the same time. A few weeks ago I was designing an architecture for a complex B2B secure communication channel and parts of it wanted to use some form of a web garden. Since I forgot to disable it, there were trouble. The strangest thing I noticed when investigating this was that everything worked the first time after IIS restart happened - sure - a session is pinned to the first worker process, the second one just gets created. Of course, there are workarounds regarding this, but they include some non-trivial WSE2 subclassing. Additional information: Microsoft.Web.Services2.Security.SecurityFault: The specified source for the derivation is unknown ---> System.Exception: WSE512: This derived key token's parent cannot be found. The reference to the parent token follows: <wsse:SecurityTokenReference xmlns:wsse="http://docs.oasis-open.org/wss/2004/01/oasis-200401-wss-wssecurity-secext-1.0.xsd"><wsse:Reference URI="uuid:227d47ac-1b2b-45a5-92f0-d7d630aeda86" ValueType="http://schemas.xmlsoap.org/ws/2004/04/security/sc/sct" /></wsse:SecurityTokenReference>. Give LOCAL SERVICE account permissions to write/modify the c:\ directory. By default Plumbwork.Orange.Eventing.dll will write subscriptions file (called subscriptions.xml) there. This line (above) - due to my extreme laziness while coding - makes me shudder. This is something I really, really, really need to clean up. I agree that next version should include a config option to use Plumbwork.Orange.Eventing.MemorySubscriptionManager instead of Plumbwork.Orange.Eventing.XmlSubscriptionManager. Even better would be to add SqlSubscriptionManager, which I can do, when I get into the GDN workspace. It took me half of today to implement a WS-Eventing based service, together with service control application and demonstration client. I took Plumbwork.Orange implementation of WS-Eventing stack. It includes WSE 2.0 based implementation of WS-Eventing specification, written by John Bristowe. Latest post about updates can be found here. Windows service queries message queue (MSMQ) after the period elapses. If it finds any messages, they are dispatched to all registered clients. There is a service control application, which can enroll new messages into the queue. There's also a simple client which you can use to register and receive notifications. Installer package for WS-Eventing windows service, which does registrations and sends notifications back. Grab it here. Source is available here. Source code, which you can use to compile the service control application. Grab it here. Source code, which you can use to compile the WS-Eventing client. Grab it here. Start the service using SCM (Service Control Manager). Service will automatically create the specified queue. Note: You should have Message Queuing installed. Start the service control application. Start the client. It will register automatically. Send notification using the service control application and watch it emerge on the client side. If you get into trouble, please email me. Have fun! They just changed its face and turned Mother Teresa. They are now going to donate code to open source community while being one of the fathers of closed source initiative. And if they are planing to donate their database product, why not donate DB2 instead of Java based Cloudscape? IBM will continue to offer its own version of Cloudscape. It believes that some customers will use it in preference to the open source version in order to take advantage of the company's technical support. What? If the idea is to offer some code to people who want to learn concepts and improve, why don't they want to participate in the game? As last year, I spoke on OTS 2004 too. This time, we discussed transactional semantics in weakly bound, distributed systems. Hope to see you on 2005's annual reincarnation of a great conference. If you already downloaded or installed a TechEd 2004 San Diego version of Visual Studio 2005 CTP you must have found out that the help system does not work. What you get is a “Downloading...” progress bar and nothing is shown. Change supportedRuntime's and requiredRuntime's element attribute version from “v2.0.40507“ to “v2.0.40426”. It just ended. The biggest IT conference (NTK 2004) in Slovenia. I managed to visit two sessions in four days, since I had four of my own (System.XML, WSE2, C# Syntax Changes, GXA stack description). The first one was an unofficial MihaK's public revelation of New Zealand Joy After One Year(tm). Great! It's still messing with my head. One guy inside is telling me it's too good to be true. The other one is forcing me to go there. The second one was the presentation of work we did during the last 6 months for a GSMA/Mobitel/Microsoft project. When a mobile operator CTO says it's good, it better be. And I believe it's super important to recognize the security characteristics & requirements as early as we did. We achived a major milestone on the hotel project I'm on on Friday. We deployed the application to complete 5th floor. Although the web site does not say much, there is A LOT of meat behind this concept. I attached a picture of the simple room control application. It's all XML. It's .NET/COM/Java. And it interoperates beautifully. We are unsuccessful with our emails to Microsoft UDDI team to upgrade our UDDI account to level 2 status. If anyone knows an appropriate contact or is able to help directly, please do so. In early November you should be updating your blogrolls with this OPML list. A lot of fresh information will be posted on those blogs. I'm a strong believer in virtual machine software (and its integration into Microsoft OS). Although I use VMWare and not Virtual PC, it's quite useful that I can play with all betas without reinstalling my bread-making machine. Why is Virtual PC 5.2 available for MSDN subscribers and not the newest, 6.1 version? What seems to be the policy anyway? ... and I know I'm not the only one. It just happened to my server. Damn. Two hours of my time wasted because I happen to have the exact config I shouldn't have. It seems that Win XP + IIS5.1 + ASP.NET 1.0 + MS03-32 Security update are not compatible. Drew notified me about my server failure. Thanks! We just did a redesign on our /webservices subsection. You can find info/downloads/functions/... on it. Everything is free to use - some contents are applicable only to local users, though. I just finished a review of a huge XML schema for the biggest mobile operator in Slovenia. By huge, I mean around 2000 lines. It takes XML Spy one second to validate an instance document on my machine. Element nesting goes ten levels deep. I just finished another developer-oriented product specification. The product is called Gama System® EDocs. It grew to 160 pages/5 documents. It's a .NET app, which includes MSMQ integration, system services and a WinForms client. Backend storage is SQL Server. It's using partitioned views to achive maximum scalability, since we're expecting over 1TB of data on particular installations. It's time to use that whip on our developers again. What seemed to be no obstacle at all is turning out to complicate my architectural designs lately. Microsoft Message Queuing (MSMQ) has this strange limitation (at least for year 2003) which prevents you to have messages longer than 4MB. Since most of .NET architects are dumping object instances into MSMQ, which get serialized into XML, we all have a problem with binary data. The problem lies in binary XML serialization, XML Schema and its base64Binary datatype, which is used in encoding. We do not get 4MB, but ~3MB message content limitation, due to a well known 1.333 factor of base64 encoding. Architectural design is now vastly different, since I have to split the binary documents, while allowing them to be linked appropriately with their parent messages. And since I'm building a document management system which will push .doc, .xls and friends on a MSMQ stack, 4MB is often not enough. I admire this guy. Not only he writes five pages of first class material from his vacation in Maui, he also does it besides the pool. Sure enough, it was it's 8th reincarnation. It finished yesterday and I gave a talk on Wednesday. Talked about XML versus CLR type system, dived into XML Schema specifics and compared early programmatic type systems with modern ones, including JVM and CLR. Well, starting with a self definition. I belong to this camp. I do a lot of work for this camp.